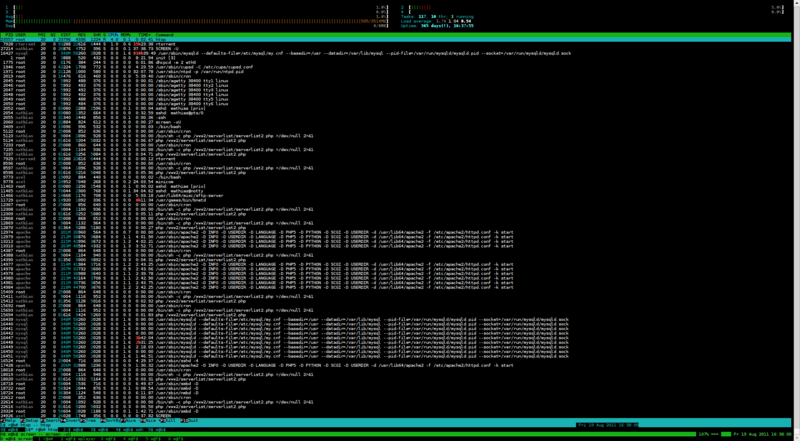 Logs of #armagetron on irc.freenode.org—These are pretty complete as I'm online most of the time, but at some point the timezone switches from CDT to CEST, and at another point it switches from latin-1 to utf-8. Arma servers XML feed—This can be viewed in a modern browser and is fairly usable, but it's intended to be parsed by scripts. Feel free to use it for your own projects. Updated every minute. Global Player Stats—Shows how long you've been online in the past and ranks you according to your online time. Also known as “addict stats”. My Arma Screenshots—All the screenshots I make with my regular game client go there. They usually show weird bugs, experiments, new features, glorious wins/losses or are just me accidently pressing the screenshot button. Doxygen Docs—Generated once in a while, these are the docs for arma's source code. You can generate them yourself with “make doxy”. Map Transformer—A small script that can transform (translate, scale, rotate etc.) a map. Doesn't work in IE. Ellipse Generator—A replacement for dlh's old ellipse generator that is now offline. The armagetronad site—Of course you want to go there and download the latest client! The Resource Browser—Lists most of the currently available maps and cockpits for armagetronad, including nice previews. This fits even less into anything useful. Lawnmower part I and Lawnmower part II—Probably the most stupid physics experiment ever. Waaay more stuff I'm just too lazy to collect into one big link list. I'll try to add new stuff, though.